When you come to Stacylynn’s class, you can be sure that you will be greeted with genuine joy and warmth. She will make you smile, she will make you laugh and then she will help you relax, let go and be able to connect with your own inner light. After experiencing her own spiritual awakening through meditation many years ago, Stacylynn realized that it was her lifelong mission to spread the healing power of yoga, one person at a time, thus beginning her journey as a yoga instructor. Dedicating herself to her practice, she began to feel the miraculous health benefits that soon helped her to heal from a lengthy illness, for which Western medicine claimed there was no cure. Passionately determined to spread the word about how yoga changed her life, the rest, as they say, is history. A little bit hippie and a little bit rock and roll, Stacylynn’s infectious energy will allow you to go within, look deep, and find the answers that you are looking for. Always providing a safe, loving and warm atmosphere, she will guide you along your individual journey with a promise to transport all who participate to the peaceful place that exists within them. 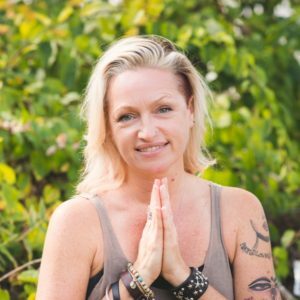 Constantly inspired by beginners, Stacylynn loves to re-introduce students who may have been intimidated by a past yoga experience to the “Real Deal” of the true yogic experience. When she is not spreading her love from the mat, Stacy is helping to heal others with her gifts as a Reiki healer and Psychic Intuitive. As an intuitive reader, Stacylynn combines her psychic gifts with a rich knowledge of astrology and the use of Tarot cards to offer you insight and guidance into events happening around you. Stacylynn uses the Thoth Tarot, a deck that has its origins in 1938. These cards were gifted to Stacylynn by a renowned intuitive from Salem, MA, long known for its powerful psychic teachers and readers. She was presented this deck with the instruction to use it to share her intuitive gifts which she does with great warmth, compassion and a vibrant laugh that will light up your day.